Friday signaled World Water Day, an annual observance day established by the UN that brings attention to the importance of having access to fresh water. There were incredible highlights on how 2.1 billion people around the world currently do not have this life sustaining resource, how many communities are drinking from contaminated and unsafe sources, and why this is largely an issue of discrimination. World Water Day also saw a variety of campaigns in the headlines for their efforts to bring this basic human right to those fighting to survive. Organizations like Water.org, WaterAid, and Waterkeeper Alliance were helping make progress towards the UN's "Sustainable Development Goal 6" and making strides to "leave no one behind" when it comes to viable drinking water by 2030. Unfortunately, with a rise in plastics in water sources, the numbers may begin to shift even further and complicate the UN's aim, as minute particles are discovered to contaminate the world's water supplies. The link between plastic pollution and access to safe drinking water is now entirely intertwined, and if steps are not taken then even the most 'developed' of nations could be in crisis. For now though, the focus is on establishing systems for marginalized groups and communities who do not have this critical resource readily available, and ensuring that every single person around the globe has the human right to water. This is so much more than just a beverage. Did you catch some of the other news about water? Like how water promotes healthy weight management? Or how it boosts the immune system? How about the way it can help improve mental states? Water is crucial for a productive body, and is a cornerstone of a thriving world, so accessible drinking water is not just about survival - it is an essential human right that is key for maintaining a healthy (and happy!) population. And unfortunately, even those that technically have access to 'clean' water, particularly city dwellers or those living in areas where systems have not been updated in a long time, are beginning to shy away from the tap. Many who pick up disposables or opt for other alternatives quote concerns about safety, distrust of privatized companies and distributors, and a general dislike for the 'taste.' This is why bottled water (which is in my opinion one of the biggest scams ever started) and home filtration systems have become so massively popular. The market is already worth a staggering 10800 million dollars, and is estimated to grow to 15000 million dollars by the end of 2025. But this comes at a cost. Remember the plastic pollution problem I mentioned earlier? Well home water purification systems use plastic filters that need to be replaced on a regular basis to keep them working effectively. A shocking 100 million cartridges are used, replaced, and disposed of every single year, and guess where those filters end up? Landfill. To put that into perspective, that amount could fill fifty jumbo jets! That is a LOT of plastic, and it is all just adding to the potable water problem for the future. But luckily this is an issue that has been noticed in the industry, and rather than discontinuing a product that encourages people to drink water on a daily basis, a new solution has been developed. 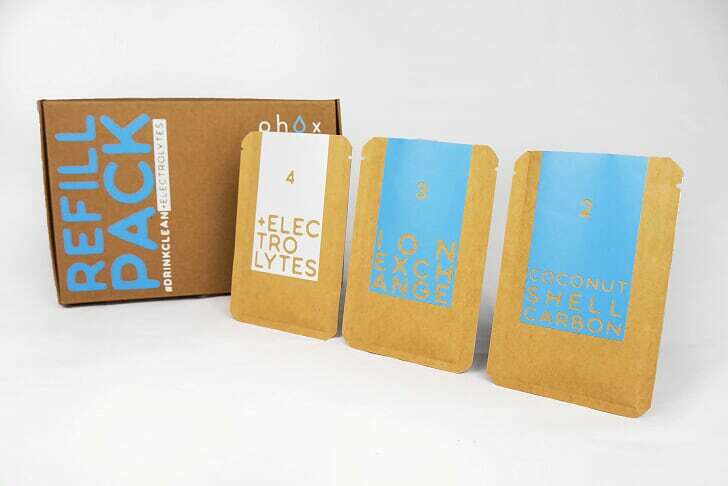 Say hello to the latest innovation in plastic free technology: Phox v2. 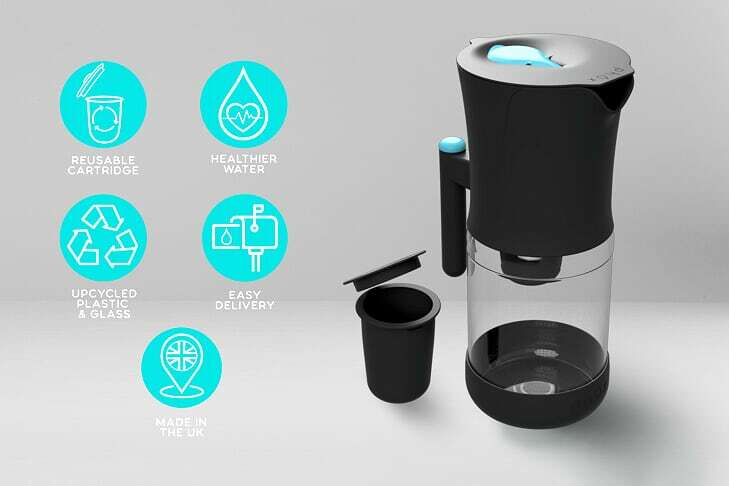 Phox Water is an innovative UK business that created a system that filters water from unwanted residual materials while also adding small amounts of beneficial minerals like calcium, magnesium, sodium, potassium, zinc, iron, phosphorus, and more. Their aim is to help reduce the amount of plastic water bottles used (a horrifying 7.7 billion each year in the UK alone! ), and make water more enticing for those a bit unsure about drinking from the tap. "The main difference is that Brita's products seem to remove minerals from water while making it slightly more acidic. Our filter adds electrolytes, anti-oxidants, minerals and alkalinity! Also the per litre filtering cost seems to be around the same, why not get more for your money?" And soon, their newest invention will hit the market and begin to make a HUGE difference in the way traditional water filters work. 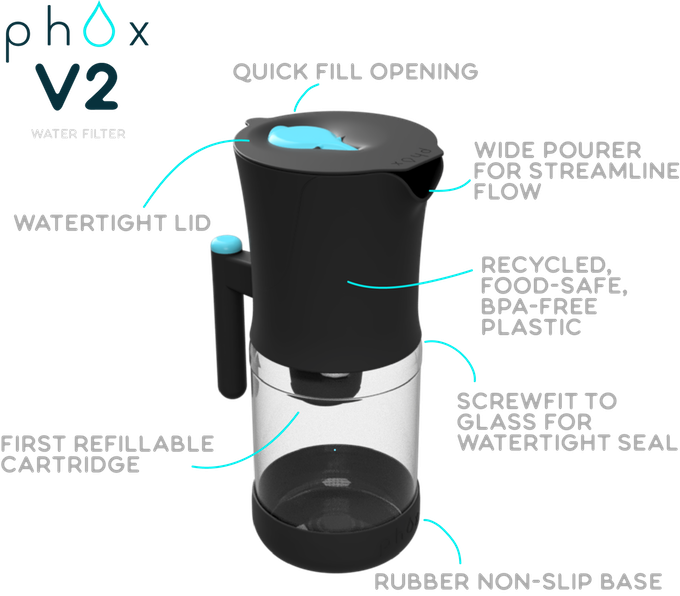 Phox v2 takes the notion of replacing your filter every 30 days and totally scraps it for a more sustainable and eco friendly approach. The updated system will feature a reusable cartridge and utilize upcycled plastic and glass for their materials while still offering the same quality of refreshing and reviving water. Even the letterbox delivery packaging and the sachets the refills come in are recyclable as they are made from craft paper! "We realised how backward it was to have to throw out water filter cartridges every 30 days. 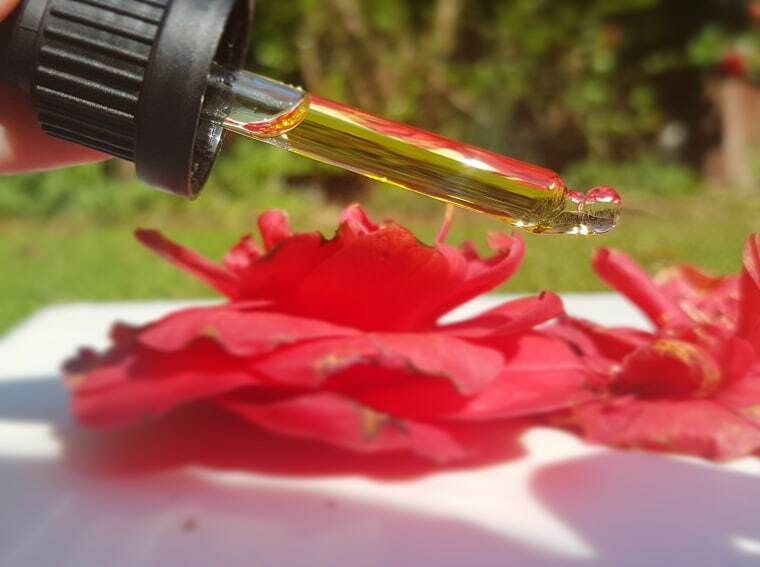 So we are leading the way with a totally reuseable cartridge." Well, there are five layers used in the Phox filtration system. One removes water hardness, one adds extra goodness, and the final three remove any potential contaminants like chlorine, copper, mercury, and lead. The materials used to do all this are coconut shell and activated carbon, ion exchange resin, and electrolytes (the "building blocks" of hydration). The system has an easy open top that contains the reusable cartridge, and you simply open it up, pop the carbon felt in to ensure no materials escape, pour in the filtration packs in order (they are labeled by number so you just count down the line! ), and then replace the lid and put the cartridge back in the reservoir! The used residues go into the bin (I would suggest dumping it into a sealed container/bag that is also going into the bin just to minimize spillage of small debris), and the empty packets can get recycled. I'm guessing it should take only a minute or two every month with no faff or fuss. "To help reduce our carbon footprint, we focused on sourcing companies locally in the UK. The manufacturing, packaging, design and distribution of the V2 is all done within a 50 mile radius of our office in Glasgow. Our filtration media is made in England." I am really excited by the potential of this product, as it can make such a difference over time. 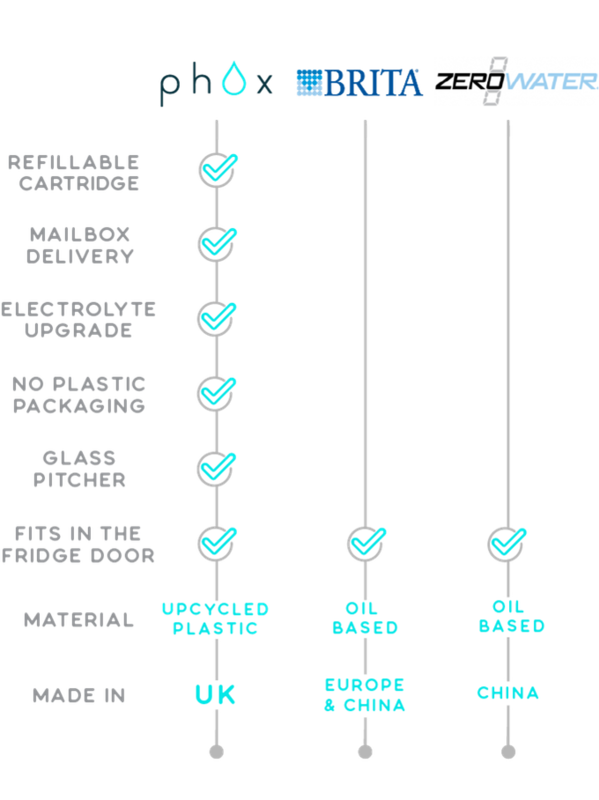 While there will always be ways to make products even more environmentally friendly and sustainable, like eliminating all disposable elements, Phox v2 is definitely the most eco option that will be on the market, and it will cut down on so much unnecessary plastic. Users will be reducing the impact water filtration systems have on the world while also having better access to clean water, and that's a great win. Imagine a world where plastic water bottles are no longer sold as people are confident in drinking from the tap. Consider how much waste can be saved each and every year. It's pretty amazing, right? That's why I am thrilled at the efforts Phox is making with their new alternative. Plus, the cost of the product and refills is pretty comparable to the popular Brita system - if cost is no barrier, then why would you not choose the more sustainable, environmentally aware version? You can still contribute to Phox over on KickStarter, and by doing so you can guarantee you receive updates on the project and depending on your donation you can even lock in an early bird rate at a 60% discount! If all things go to plan, Phox is hoping to have the first batch production completed in August 2019 and the first finished products shipped out that very same month. 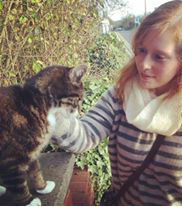 How exciting is that?? Even if you can't offer any financial backing, do consider heading over to Phox and expressing your interest to show your support, or maybe even share this post or their KickStarter campaign to spread even more awareness and help get even more of a buzz going! 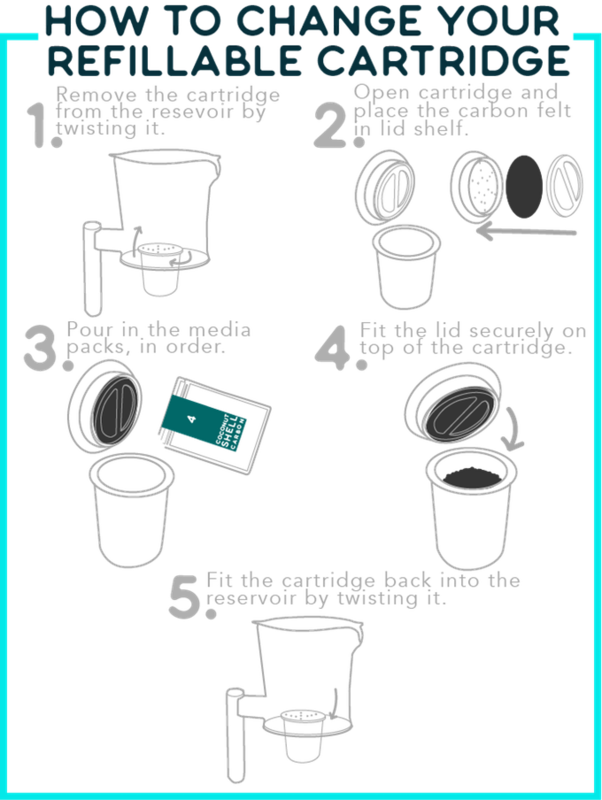 Tell your friends who are water filter users about the initiative, and have a chat over coffee about the importance of getting away from single use plastics, especially when it comes to the future of our water and world. This sounds like a really interesting filer, I have to admit I've not had a water filter in my home for a while now, but I would definitely be up for trying one again, especially if it is eco friendly. I was always worried about the filters in the past. Wow my husband loves Brita products but this has a lot more benefits. I'll have to tell him about it. Ooooooooooh, now this really is clever! I've had a B***a filter for years, and throwing the filters away always made me cringe! I am really interested in this because I've tried both Brita and ZeroWater and I was thinking that it was a shame that these water filtering jugs are plastic and are not that eco-friendly. I did wonder whether there was something else out there that I could try and now it's exciting to know that there is another water filtering solution coming to the market that is much more eco-friendly! I will definitely be interested in trying it once becomes available. This sounds like a great product. I have a ZeroWater jug and a Brita filtered bottle but had been looking to see if there was anything more eco friendly out there. I really like how sleek this looks and it is something I should think about given my Brita Filter no longer works!